#Dunkirk – Review Repost – In Stores Now!!! The Mole (1 week): As the men are driven out of Dunkirk, France they are forced to the beach. Tommy sees Gibson burying a fellow soldier. No words are exchanged before German bombers are shooting from the air. After the shots die down, Tommy and Gibson find a wounded comrade and carry him to the nearest ship for evacuation. The British ship is only accepting British soldiers, so Tommy and Gibson feel safe. Until the captain tells them the ship is full, they will only except the wounded. The two hand over the wounded soldier but hide below the dock. They learn that the British believe that of the over 400,000 men, they will only be able to save 40,000. Tommy and Gibson’s hopes of survival nearly defeated. With home 26 miles away, can both men make it? The Sea (1 day): Mr. Dawson has heard the call from the British navy. The need to commandeer their vessels to save the men on Dunkirk. He and his son Peter remove anything not needed and load their boat with life vests and head to Dunkirk. Just as they are about the ship off, George jumps on to help. He believes he will be of service to the two. Within hours they find a soldier that is shipwrecked and shell-shocked. When the soldier learns they are going back to Dunkirk, he panics and violently bumps into George. George hits his head and is bleeding badly. Mr. Dawson must decide to save one or save several. The Air (1 hour): Spitfire pilots Farrier, Collins, and their leader trying to keep the enemy bombers at bay so the land soldiers can have the means and time to evacuate. In the first few minutes, their leader is taken down and Farrier takes command. He realized that he and Collins are low on fuel and have to conserve their resources while maintaining enough fuel to go back. But after Collins is forced to make a water landing, enemy bombers are en route to Dunkirk. Farrier must stop the bombers and get back with only reserve tanks at his disposal. Please see this movie in 70 mm if you can. This wide high-resolution film gauge gives you the best perspective while making it feel like a documentary. Remember you are watching 3 different stories which all have their own duration of time. The mole, which is the story of the land battle, is told over the course of a week. The sea’s timeline is told over the course of a day. The air is told over the course of an hour. So if you see night time, the movie has switched to the land story. Then, it will drastically change back to daytime to tell the air or sea story. Of course, all 3 will come together at the end, but all three stories are expressed vividly. You will feel yourself become nervous each time you hear a plane’s engine above. You will feel happy when the men are saved and dread when they are attacked. It is an emotional film that will draw you in with stunning cinematography and painstaking attention to details. 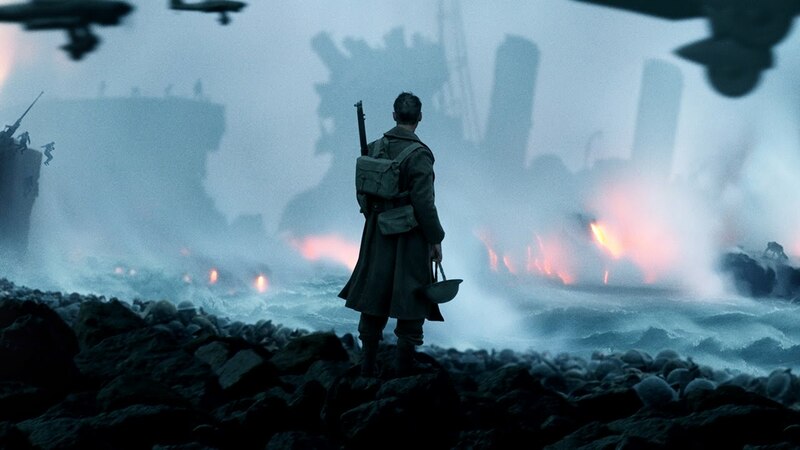 There is no character build up in Dunkirk, it immediately starts with war. This is one to watch, but be warned the war scenes are realistic, honest, and brutal. This is a must-see.